The theme this month for the St Luke's charity card challenge is "Oh I do like to be beside the seaside". Now I don't possess any suitable stamps so I created a card using Craft Artist. The picture in the photo frame is a photo of the entrance to Dartmouth that I took and I used software to turn it into a pencil sketch so that I could give it a colour wash. I decoupaged the starfish and the shell and added some gingham ribbon. Thanks for looking and please leave a comment they are much appreciated. What a creative way to enter our challenge - I love your little framed scene! Thanks so much for joining us this month. 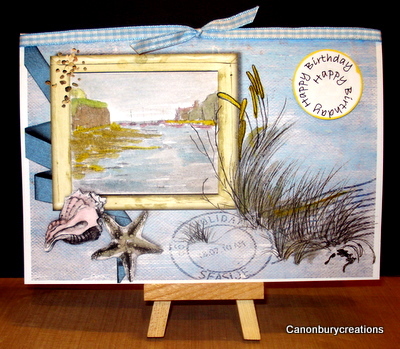 Wow Val this is gorgeous...and created using CA..
Love your picture in the centre of your card and the ribbon effect down the side. Thank you for once again supporting St Lukes Charity card challenge. I think your picture is fabulous - using your own picture and making it a sketch is a brilliant idea. Thanks for playing along with St Luke's Charity Card Challenge. What a good idea to turn your photo into a pencil sketch - really effective. This is amazing and very creative. Thank you so much for joining us at St Lukes Charity Card Challenge.